Over the years Finn Projects has developed an energy auditing procedure that encapsulates all factors affecting energy use and cost in our client's facilities. Equipment Inventory & Operation Schedule Analysis - Involves the detailed inventory of all energy-consuming and water-consuming equipment along with an analysis of operating schedules currently in use by site staff. Utility Billing Analysis & Baseline Development - Involves the analysis of a two-year history of billing data taken from the gas, electricity and water invoices. The weather-corrected monthly tally of energy and water is use to provide a performance baseline against which we track future utility performance. Identification of Energy and Cost Saving Opportunities - A list of realistic opportunities for sustainable consumption and cost reductions are developed along with financial analysis to support a business case. Analysis of Behavioural and Organizational Patterns - This stage involves the analysis of current behavioural and organizational patterns and in-turn provides recommendations for changes that will reduce utility consumption. 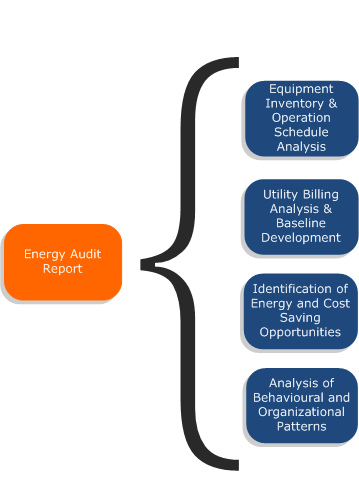 Energy Audit Report - A comprehensive readable report intended for the operations and finance professional. While our energy audit is comprehensive and thorough, its main objective is to identify all opportunities for utility cost savings. For higher cost and longer payback measures emerging from the audit, we undertake a detailed feasibility study to ensure there's a solid business case with risk assessment to enable irrefutable decision-making.